My watercolor "Elm Street" received the Blick Award at the North East Watercolor Society, 31st annual International Exhibition. My Mobile "Icarus Falling" has been selected to be included in the 2008 New Jersey Arts Annual: Tribal Roots in the Garden State from February 24 to May 11, 2008 at the Montclair Art Museum. 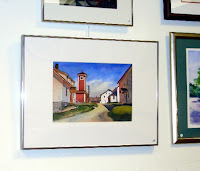 See a video of Icarus Falling by following the video link in the right hand column..
My watercolor "Canterbury NH." received the Best In Show award at the Pascack Art Association Annual Member Show. My watercolor "Canterbury NH." is now on display at the Pascack Art Association Annual Member Show at the Hillsdale, NJ Library Gallery. The show will be on view untill Oct. 28. Join us for a Reception on Oct. 14th. from 2 to 4 PM. The size of the painting is 18x22" and it is priced at $350.